Srila Prabhupada is not advising us to follow Kanisthas. On the contrary, because they offer insufficient guidance, Srila Prabhupada tells us to be careful to instead accept an Uttama-Adhikari as a spiritual master. 1) That Krishna will make up for the lack in qualification of the spiritual master, and this is stated by Bhagavada Gita 9:22 – “yoga-ksemam vahamy aham”. However, this verse, nor its purport, make any reference to the fact that one may accept an unqualified spiritual master. 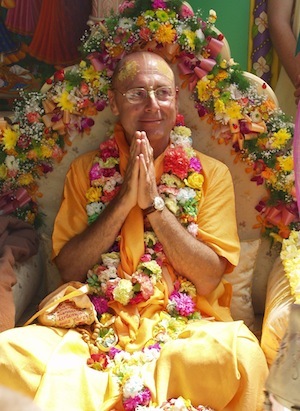 As has been documented in detail on this website, SRS continues non-stop to spout his own “teachings”, which are not only never mentioned by Srila Prabhupada, but often are the exact opposite of what Srila Prabhupada teaches. Again and again he demonstrates that he does not have a grasp of even Srila Prabhupada’s most basic teachings.